Today we had are third team meeting for the brief that we have been set, which is to create a brand which is composed of a website, a channel and a series of videos. 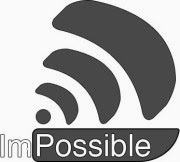 From the pervious meeting (see previous blog post) we have finally decided that the brand will be called I'm Possible. We have finally decided on this name for the brand because it is the brand name that has tested the best. We have also decided that the logo below will be the base idea for the brand logo, although the one below does need some changing. However the main reason for the team meeting was that we had to finalise the ideas for the videos. After some discussion we have decided that we would be creating spoof videos. We feel that creating spoof videos would be the best decision due to the fact that we feel that more relaxed and fun vibe that spoof videos have would be the type of videos that would captivate our target audience (16 to 30 years olds) the best. These we felt were the most obvious modes of transport that people would think of when asked about futuristic transport. After we had choose the modes of transport that we would be focusing on within the videos we needed to think of way to make the video make sense and feel part of a brand. After some discussion we felt that the best way to do this would be to have the videos as small news broadcasts in which we would have someone reporting on new breakthrough technology, such as jet packs. After this meeting we were all set are individual tasks, which included someone ordering the kit that would be needed for the videos, someone writing the scripts for the videos and another designing the website. I will be coming up with some ideas for the website and will be meeting with the person we have put in charge of graphics soon to discuss ideas for the website, before I go and make it.